This post was written by Dan Fernandez, Principal Group Program Manager for docs.microsoft.com. 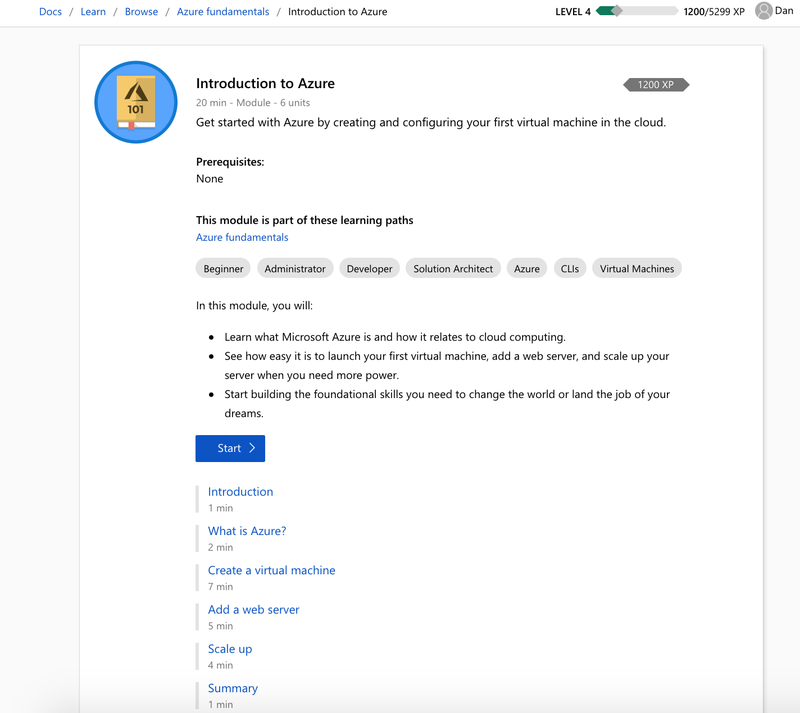 Microsoft Learn is the easiest way to learn products and services through task-based, interactive learning with over 80 hours of free content, localized into 23 different languages, covering Azure, Dynamics, Power Apps, Flow, with more coming in the future! You can find more information on our Introducing Microsoft Learn blog post. All learning content is organized into modules, with 5 to 7 steps (also called units) covering a specific topic and is around 30 to 60 minutes long. As you can see below, each module has an overview, a set of learning objectives, time required for each unit, prerequisites, and the amount of Experience Points (XP) rewarded. Learning Paths are ordered lists of modules that cover a broad set of topics, like the Architect Great Solutions in Azure Learning Path shown below. For new customers, learning a cloud platform can be frustrating, given the need for a credit card and a cell phone number to validate a free account. Existing customers also don't want to use their company's production Azure subscription for learning. To remove friction in the learning process, we've created the Learn Sandbox, allowing free, fixed-time access to a cloud subscription with no credit card required. You can safely learn, create, and manage resources without the fear of "breaking production". Another key piece of feedback from customers is that while video and text is important, they prefer to learn by doing. To enable that, we've integrated the Azure Cloud Shell which enables you to run Azure CLI, Azure PowerShell, .NET, Java, Node.js, Go and Python code directly in the shell, or use many of the included command-line utilities like Git, Kubectl, Helm, and more. All of this is available directly from your browser with no installation or configuration required. Azure Cloud Shell also includes a browser-based code editor you can open by typing code .. It comes with basic syntax highlighting, allowing you to quickly create and edit code or configuration files in a familiar environment. Knowledge Checks are a set of multiple-choice questions designed to reinforce learning and comprehension. One key design goal of Knowledge Checks is to focus on learning content and not on "being right". You won't be penalized for answering a question incorrectly and we also provide context and information on why some chosen answers are not the correct ones. To validate that you are successfully completing learning tasks, we've added Task Validation. As an example, below you can see how we use Azure Resource Manager to validate that the Azure Virtual Machine the user created in the module was deployed correctly. Points: Earned when you complete a unit in a module. Achievements: Earned when you complete all units in a module (as shown below). 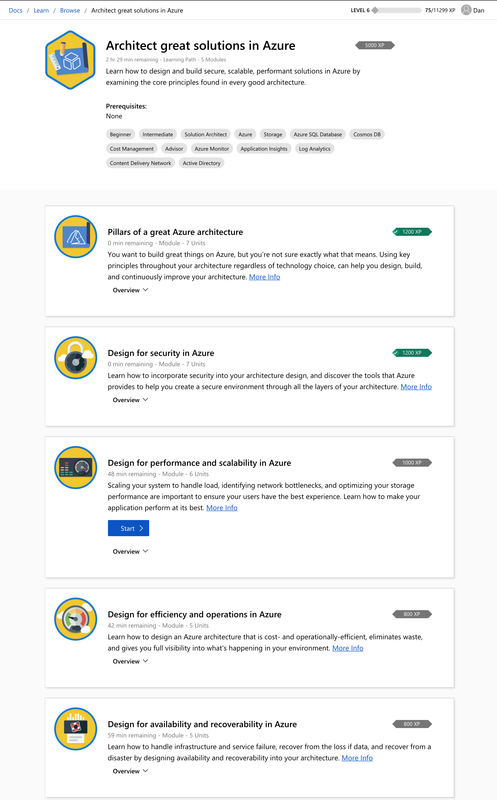 Trophies: Earned when you complete all modules in a learning path. Levels: The more points you get, the higher your level. 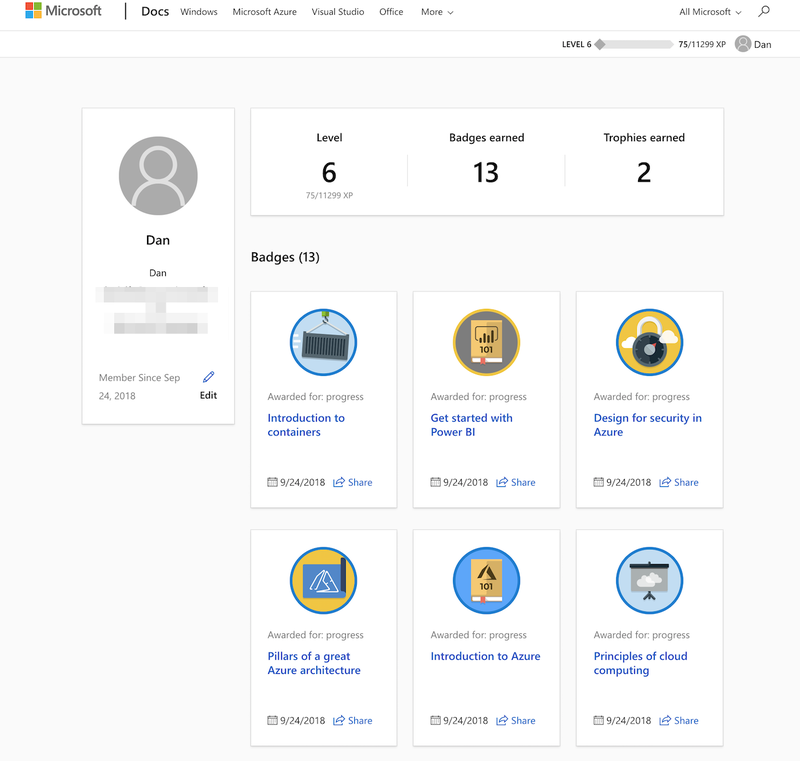 As part of your initial registration, you also set up a user profile to share your points, achievements, trophies, and level with other users. We want to improve the Microsoft Learn experience even more, and we need your feedback - let us know what you think, on GitHub and Twitter.